DANNY LA RUE knew a thing or two about show business, and STEVE BARCLAY spent many years working alongside the legendary star. 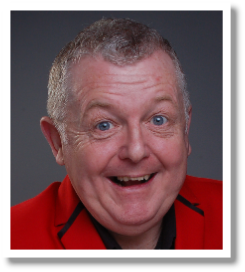 Steve's personal experiences of teaming up with Danny - and a host of other top-line performers - has seen him hone his craft in comedy, cabaret and variety and as a corporate and cruise-liner entertainer. Steve Barclay worked with the legendary star for many years as Danny’s supporting comedian on his many summer seasons and UK tours working in Danny’s long running show Danny’s Dazzling Music Hall Show, The Good Old Day’s and ‘Four for the road’. Whilst Steve was working with Danny he made his first appearance at the Leeds City Varieties home of the famous ‘Good Old Days’. 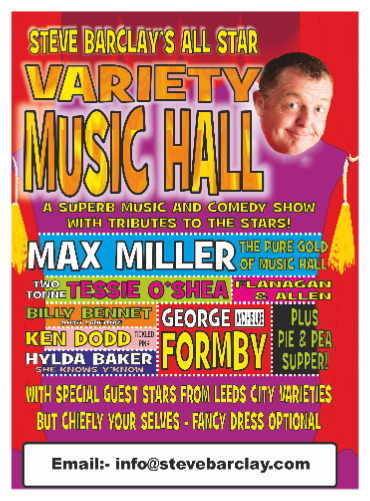 Since then of course Steve has been a regular feature at the venue paying tribute to MAX MILLER, GEORGE FORMBY, KEN DODD and TWO TON TESSIE O’SHEA, working with Ted Rodgers, Jimmy Cricket, Ray Allen, and as many a music hall chairman has said ’ a melange of Music Hall and Variety favourites’. Steve Barclay’s Swing With Laughter Big Night Out has entertained at many prestigious corporate events in the UK. Whether you are looking to create a sophisticated ambience or want to see the dance floor explode this function band will deliver. 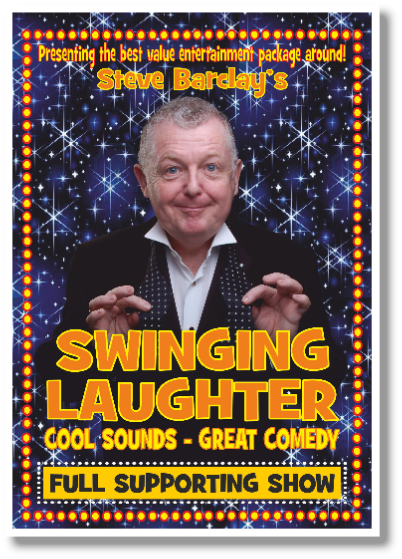 STEVE BARCLAYS SWINGING LAUGHTER SHOW perform at weddings, social functions and corporate events nation wide. The band is extremely flexible and can perform music from a wide range of styles: Jazz, Latin, Swing and Soul, and so can suit any occasion or audience. AN EXCELLENT EVENING IS GUARANTEED WHEN YOU ‘SWING WITH LAUGHTER’! 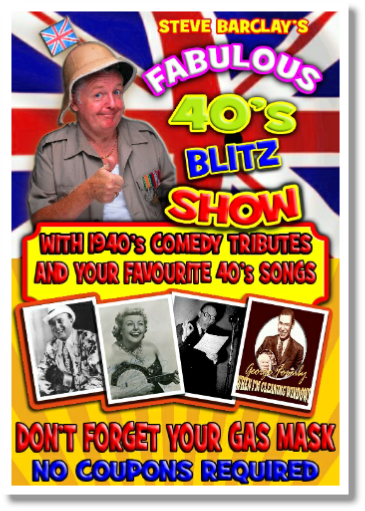 Steve Barclay’s 1940’s Hits From The Blitz Show pays special tribute to those unforgettable artistes who had their own unique styles, from the swinging sounds of Frank Sinatra to the soft tones of Bing Crosby and comic songs of George Formby and a host of your 1940’s comedy favourites. 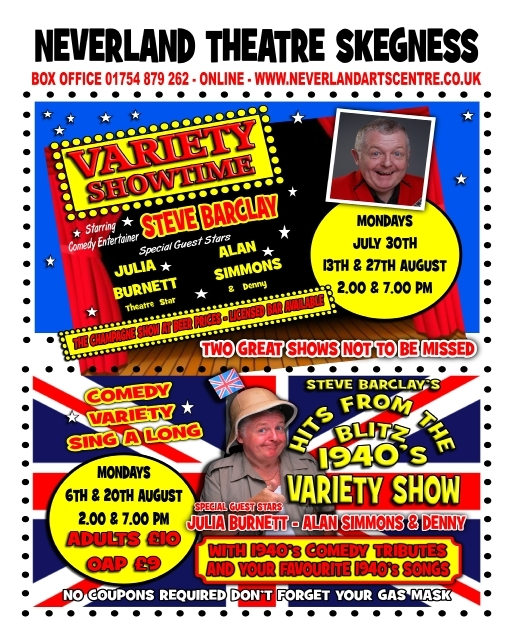 Steve Barclay presents a lively program tailored to the requirements of each event, entertaining your audience and ensuring a good time is had by all. Its great to see the audience singing and dancing along, bringing back the nostalgic feeling of the 1940’s. At this time emotions were naturally heightened, influencing the music of the era. Artist of the time wrote lyrics that portrayed feelings of saying farewell, feelings of love and feelings of cheer to keep spirits high. There was also some influence from across the Atlantic, American troops who were stationed in the UK brought with them sounds of Jazz, Swing and Blues. available in multi formats including FULL SUPPORTING SHOW.